I order a lot of plants from you. I reuse or recycle the packing boxes and also compost the newsprint that you wrap around the plants. But I don't know what to do with all the polystyrene packing peanuts used in the packaging. I don't want to throw them in the trash and my local recycling center doesn't accept them. Do you have any suggestion about what I can do with them? Also, please forgive me for asking this awkward question, but why do you use this material when biodegradable packing peanuts are now available? I'm guessing that you must have a good reason, because your company seems environmentally conscious. I know that you don't print a catalog and that you mostly use insects to control garden pests. I appreciate your recognition of our emphasis at Flowers by the Sea on ecofriendly practices. It's true that we conserve resources by not printing a catalog. It's also true that we mainly use beneficial insects to control pests. Yet it isn't easy being completely green. 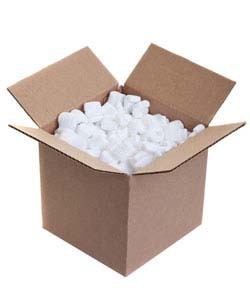 At FBTS, we must use expanded polystyrene (EPS) packing peanuts in our packaging. I have two good reuse ideas to offer, but first it's necessary to explain why we use this material that is also referred to as a "plastic #6." Plastics numbered 1 to 6 are all recyclable. Although recycling organizations don't accept plastic #6 curbside, many accept large pieces of it, such as from packaging big objects including TVs. Yet few accept EPS packing peanuts, because they consume lots of space in trucks and don't provide enough foam to be cost-effective for shipping to companies that process plastic #6. We dislike using any products that we don't consider to be earth friendly. Yet EPS packing peanuts are a necessary evil for us, because we have to deliver plants in healthy condition and at an affordable cost to customers. Biodegradable packing peanuts are a poor choice for Flowers by the Sea, because they are made from plant starch and dissolve when wet. We significantly hydrate our plants before wrapping them for shipping. This moisture might not destroy a whole box of bio-peanuts, but it would turn enough of them to useless goo that our plants wouldn't be safely cushioned for shipping. Even if bio-peanuts didn't fall apart in transit, we would be opposed to them because they are made from genetically modified crops (GMOs) -- a topic for another day. We've explored other possibilities, such as packing individual plants in containers made of compostable mushroom foam. Although it appears that plants might survive well in these containers, they are expensive and would drastically increase the size and weight of shipping boxes. This would make shipping costs unaffordable for most of our customers. So we continue to look for a better packing material. As to your question about how to recycle EPS peanuts, I think the best thing to do is to reuse them for shipping. If you have too many for your personal shipping, consider donating them to local companies that need large quantities of shipping materials. Many mail carriers, such as UPS and PakMail, accept used packing peanuts as long as they are clean. Ironically, another great use involves container gardening. You can place EPS packing peanuts at the bottom of large planting pots to cut weight and save potting soil. The only problem with this practice occurs when you forget about the peanuts in the bottom of the pot and decide to recycle the soil by adding it to your compost heap. You end up with bits of polystyrene in the muck. But here's a clever solution collected from reader comments at This Old House: Put the peanuts in drawstring mesh bags -- like the kind used for apples and oranges -- and place them at the bottom of pots. The reader says that when she empties the pots, she rinses the bags full of packing peanuts and reuses them in other container plantings. Thanks again for being understanding of the fact that we really do try hard to be as green as possible. Don't hesitate to contact us with more questions. If you have any suggestions for alternative packing materials, we're ready to listen.